If you’re after true privacy, Smuggler’s Nest has got you covered. Surrounded by lush vegetation and not visible from the road, the home provides total peace and seclusion. Honeymooners or couples vacationing together (the home can accommodate 4 people) will enjoy the open-air floor plan and spectacular views from every room. Nearby Smuggler’s Cove offers some of the best snorkeling in St. Lucia, and a championship golf course is just a short car ride away. A pool and two gazebos add to the exterior features and are perfect for lounging, sunbathing, and utter relaxation. This home is one of the finest in the whole Caribbean and was extensively described in one of the issues of Architectural Digest. Its lush tropical garden houses many different kinds of palms, flowers, plants and trees. It is a romantic place for honeymooners. This very secluded and easily accessible villa is not visible from the road and is perched on the hillside above Smugglers Cove with views of the ocean and the coastline from all the rooms. 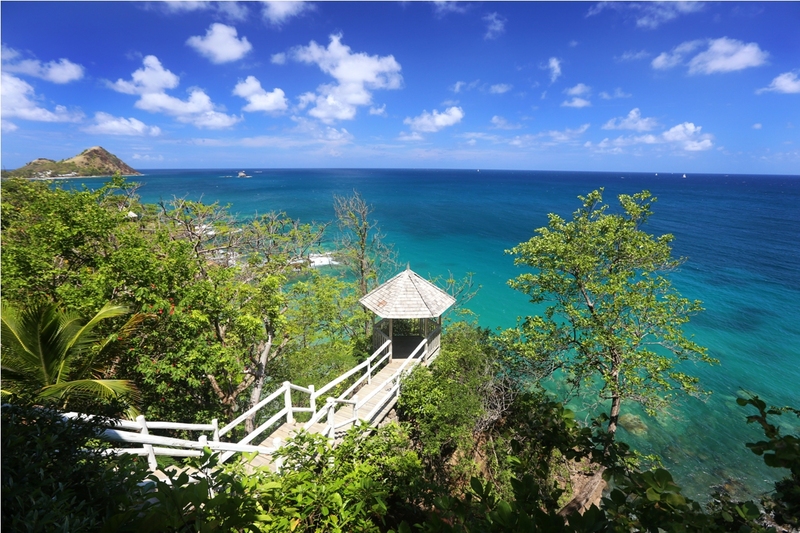 Smugglers Cove has a sandy beach and the reefs provide one of the most interesting places to snorkel in St. Lucia. A championship 18-hole golf course is just minutes away by car. Smugglers Nest has all the elements of a dream home in the Caribbean, from its architecture to its location to its landscaped gardens with a network of footpaths that allow for leisurely strolls. You can rest for a drink in one of the two gazebos, one of which looks out over the sea; the other one is tucked away in the garden. Or, have lunch on one of the terraces around the house. A large swimming pool interchanges with the sea and is nestled below the house, affording views over the ocean. Last, but not least, you should have your sunset drink on the lower deck which provides views of Pigeon Island. The house is designed in an open plan, so it can benefit from the cooling tropical breeze. It is furnished with antique Indonesian furniture and artifacts set against a dazzling white background giving a unique blend of the old and the sophisticated. There are two airy living areas: one for lounging; the other, a TV room with cable television. The open plan dining room is adjacent to a kitchen and series of open patios. The master bedroom has a king-sized bed with unusual bamboo posters draped with a net. There are small patios off this room giving a 180-degree view of the ocean. Complementing this bedroom is an ensuite bathroom with the privacy to enjoy “a bath for two with a view,” a separate shower and dressing room, this first bedroom has air conditioning. The second bedroom has a gallery with the bedroom on a lower level, opening on to its own large private patio. This has a double bed and a large ensuite shower room. A study and another conveniently located bathroom complete this house. Smugglers Nest accommodates 4 people. Because of the cliffs, children under 16 years of age are not allowed. Resident watchman/pool maintenance and gardener lives in the gatehouse in the garden (Tom and Trevor). This villa is not rented in the winter months. There is a small beach immediately below the villa. It's a short, but steep walk on steps. Smugglers Cove beach is a 5 minute walk from the villa. Sorry, no children under age 16 are allowed. Our visit to Smugglers Nest was exceptional. This was our second visit and will not be our last. I can not begin to thank Olga and Ton for enhancing our stay by making sure that our every desire was met. A wonderful experience.